It is easier than ever to find great cordless power tools no matter the brand, so to set your company apart from the rest you need to think outside the box. 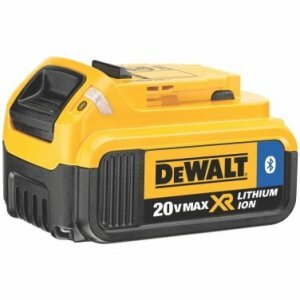 DeWalt may have done just that with their new line of Bluetooth enabled 20V MAX 2.0 Amp (DCB203BT) and 4.0 Amp (DCB204BT) lithium ion batteries. Of course, Bluetooth by itself is pointless, which is why DeWalt has introduced their Tool Connect App, which allows users to control their new batteries with their smartphone. What can the DeWalt Tool Connect App do? According to DeWalt, the 20V MAX 2.0 Amp (DCB203BT) and 4.0 Amp (DCB204BT) lithium ion batteries, when teamed with the Tool Connect app, have been designed to solve a number of jobsite problems that users face every day. Using Bluetooth technology, the two components are easily paired together to allow information to stream wirelessly between the two devices. The big question we all have on our minds is how this system can really work for us on our daily tasks; so let’s jump into the features and see what the system has to offer. From the home screen of the Tool Connect App, users can select from a list of connected batteries to view the diagnostic information of the battery. From there, they can see its state of charge, temperature, and Bluetooth connection strength. In my opinion, the most valuable feature here is the ability to see the state of charge for a specific battery, especially if I am waiting for it on the charger. The temperature information might also be handy, but I am not too worried about a battery overheating, because of all the safety features that are built-in these days. Connected via the DeWalt Tool Connect App, a user can actually remotely disable a battery to prevent tool usage. They can either do this manually, or they can enable a setting that automatically disables the battery once it goes out of Bluetooth range. A similar battery lending feature allows users to set an amount of time a battery can be used for, then afterwards the battery will stop functioning. This is another great feature that has the potential of discouraging tool theft, but unfortunately it is not a complete anti-theft solution. After all, once the battery is removed, it can be replaced with a non-Bluetooth battery and work just as before. Combined with the features mentioned above, the DeWalt Smart Batteries and the App can send out Alerts when a condition or setting is triggered. For example, an alert can be sent when the battery is completely charged, or one can be sent when a battery leaves Bluetooth range. Alerts can warn of high battery temperature, or when the battery is getting low. I don’t much like the idea of having to turn to my phone to see all the information of a battery, so an alert is a good way to get information I need without having to look down at the phone. This would be especially true if each alert uses a different sound. Are Bluetooth Enabled Batteries Enough? I think DeWalt is heading in the right direction with Bluetooth enabled batteries, but is it a powerful new feature or is it a gimmick. I have a feeling that some people are really going to love it, while other find it to be too much of a hassle. I don’t see the technology as it is currently as being very useful for the average person that owns their own tools, but I can see it as an advantage to companies that lend out tools to their employees. There are two big problems with the way the system is set up, but the biggest is Bluetooth range. Most of the features require the smartphone and the battery to be within Bluetooth range, but how likely is that going to be when a Foreman lends tools out to his workers on a jobsite? The second problem is that the technology is in the batteries when I think it should be in the tools. If you have not heard by now, Milwaukee Tool has announced a similar technology called Milwaukee One Key, which seems to do everything DeWalt is offering and maybe more, but the technology is in the tool. Sure this means you would have to go out and buy a whole new set of tools if you wanted to use it, but an anti-theft feature could actually completely disable the tool. DeWalt, on the other hand, has the advantage of allowing users to upgrade their existing tool with a simple battery upgrade, and maybe that is all people need or want right now. Visit the DeWalt Tool Connect page for more information, or check out the app for Apple or Google devices and purchase your own batteries now. The DCB203BT retails for $99 (MSRP) and includes 2 years of free service. The DCB204BT retails for $139 (MSRP) and includes 3 years of free service.